My father, Maxime Chalmin, was born in Coulandon, France, in October 1909. In his late teens and beyond, and after a series of "apprenticeship" assignments as was the professional development protocol in those days, he came to the United States as a cook at the Belgian Pavilion at the 1939 New York World's Fair. Once completed, he returned to France but vowed to return to the United States to start a new life. After the war which he spent in Vichy, France with his new wife Marcelle and newborn son, he left France behind to pursue his dream. In 1948, he landed (again) in New York harbor with his wife and a 4-year-old son to begin this saga. It was to be the fulfillment of a lifelong dream and the beginning of another. As a young man, raised by a widowed mother in central France, he was always restless as he pursued his passion of being a chef. In France at the time, "apprenticeships" involved working and studying under leading chefs and traveling to other countries to learn new cuisines and cooking methods - which he did. He loved and learned in these "apprentice stages' In Paris, the Cote d'Azur, Cuba, America and Morocco (where he almost left his new family were it not for a last minute visa to the US)! I still vaguely remember our first months/years after arriving in Flushing, NY. As a 4-year-old, it was easy for me to learn English - not so for my parents. 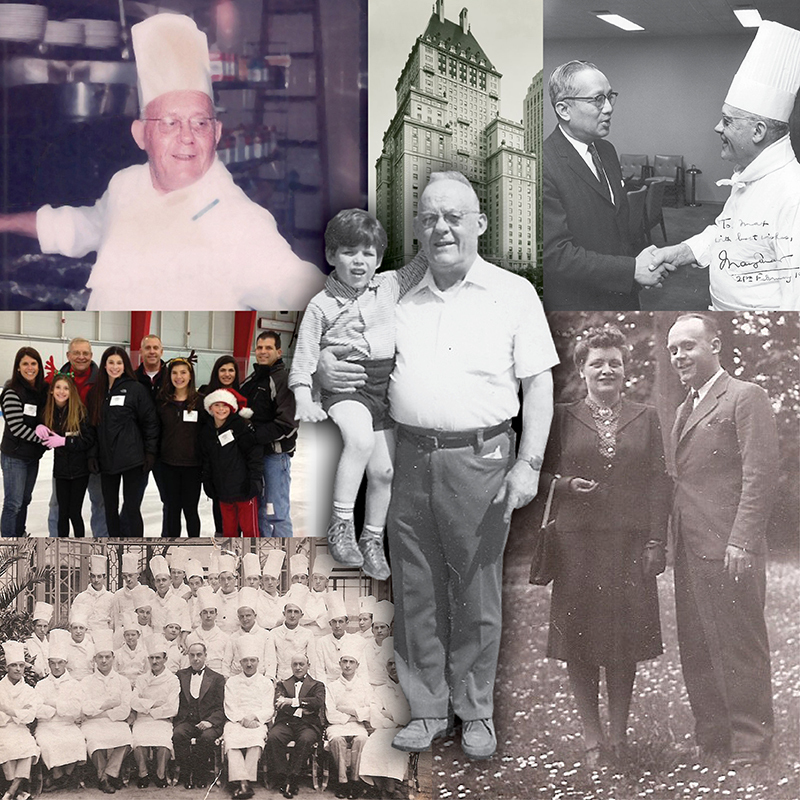 My father was then "Sous Chef" at the prestigious Plaza Hotel in New York City. We then moved on from place to place as my father progressed up the ranks in the culinary world. To West Virginia (The Greenbrier Hotel), Cleveland (The Union Club), Los Angeles (The Ambassador Hotel), St. Louis and finally back to New York (The Park Lane Hotel). I was 10 and longing for stability! It came time when my father became Executive Chef at the Park Lane and subsequently at the ever-famous Toot's Shore restaurant. We finally had found stability when my parents bought our first home on Long Island, New York, and he became the Executive Chef at the United Nations - a position he held for nearly 10 years. We are very proud of the photograph taken with my father and then U.N. Secretary-General U. Thant, upon his retirement. We lived in New York until he retired in February 1967 and bought a restaurant in Belgium ("Le Val Vert"). He returned to the U.S. in 1972 and finished his career teaching Culinary Arts at the prestigious Culinary Institute of America (CIA, Hyde Park, N.Y.) and finally at Johnson & Wales Culinary College (Providence, R.I.) where he taught until he died in 1977, passing on his knowledge to future chefs. Pour afficher cette histoire en français, cliquez ici.